There is something to be said about good old-fashioned, hearty home cooking. They are recipes that have been around for years and get passed down from generation to generation. Just the thought of these meals take you back to your childhood or bring back warm memories. And sometimes just the smell of something cooking can put you right back at that old table in your grandmother's kitchen. Even simply hearing the words "pot roast" reminds me of growing up, and that's funny because we rarely ate it. I guess it's the style of cooking that takes me back. Sunday dinners were often cuts of meat roasted or braised with potatoes and veggies. So when it comes time to plan my Sunday dinners, I often turn to comforting one-dish meals. Although I prefer my Dutch oven for braised meats and stews, I have been turning to my slow cooker more often. Pulled meats for sandwiches or tacos are my most popular slow cooker meals, but last week I wanted something that would be a complete meal all in one pot. My supermarket had chuck roasts on sale, so pot roast it would be. 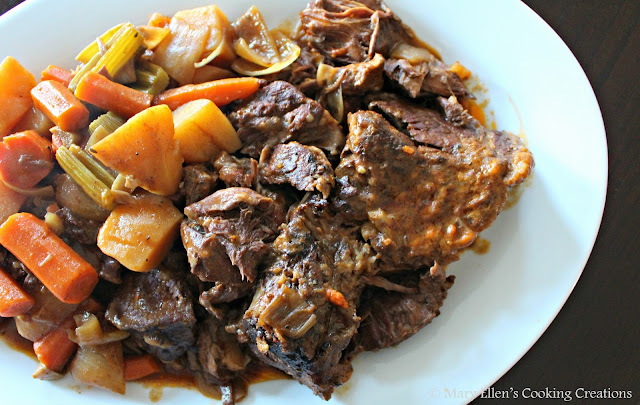 I have several different beef stew recipes that I like to make, so I used them as inspiration as far as the seasoning, searing and deglazing method, and veggies. For liquid I usually turn to a dark beer like Guinness, but decided to play with red wine and beef stock for this dinner. The gravy produced from this dinner was so rich, thick and packed with flavor. The beef fell apart and you didn't even need a knife to cut it. Leftovers the next night were just as good, if not better. The fat will rise to the top after sitting in the fridge overnight, so skim it off with a spoon before reheating the meal. The only thing that would have made this dinner better would have been a snowstorm outside and a loaf of warm, homemade crusty bread! Season the roast with the thyme, cayenne, onion powder, garlic powder salt and pepper. Coat in flour, shaking off any excess. Heat 2 Tbsp olive oil in a large saute pan over medium high heat until shimmering. Add the roast (being careful to set it down in a direction away from you to avoid splatter/splashing) and sear on all sides. Take your time on this step - you want a good sear. Once completely seared, transfer the roast to a warm slow cooker and surround with the carrots, celery and potatoes. To the pan, add 1 Tbsp olive oil. Add the onions and garlic and saute 2-3 minutes. Add the tomato paste/water mixture and stir until combined. Add the wine and bring to a simmer. Pour the wine mixture over the roast followed by the beef stock and bay leaves. Note - add the beef stock slowly as you may not need all of it. You want the liquid to just barely cover the food. Let cook on high for 4 hours followed by 2-4 hours on low. Check seasoning during cooking and adjust, if needed. Once done, transfer the roast to a dish. Note - it's going to be falling apart so you will want an extra spoon to help you do this. You won't even need a cutting board to slice the meat before serving! Using a slotted spoon, transfer the veggies to the serving dish. Serve the meat and veggies with some of the gravy, being sure to remove the bay leaves first. 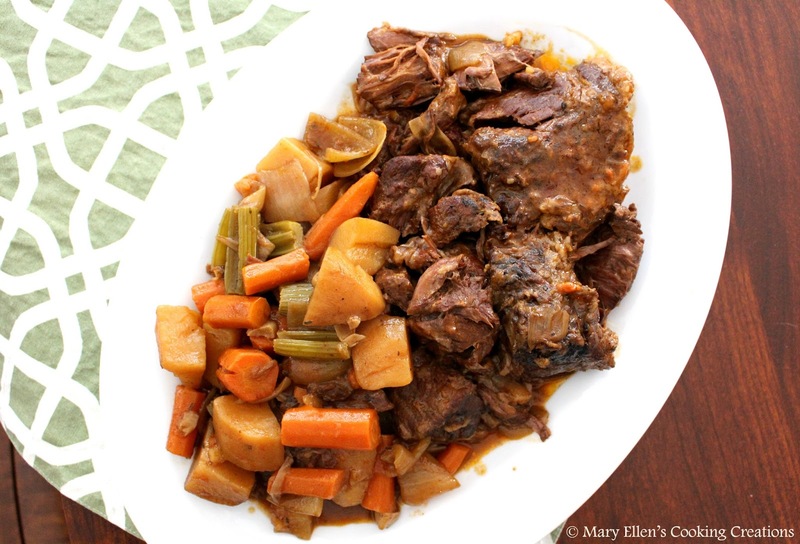 Utterly smitten with pot roast -- one of the most comforting meals on the planet! I make mine in a a dutch oven and cook it in the oven, but I think the slow-cooker achieves the same thing. Why then, don't I just pull out my slow cooker? I don't know. I agree - I definitely prefer using my Dutch Oven, but when I can't be home to watch it I'll use my slow cooker. I was happy with how this recipe turned out! 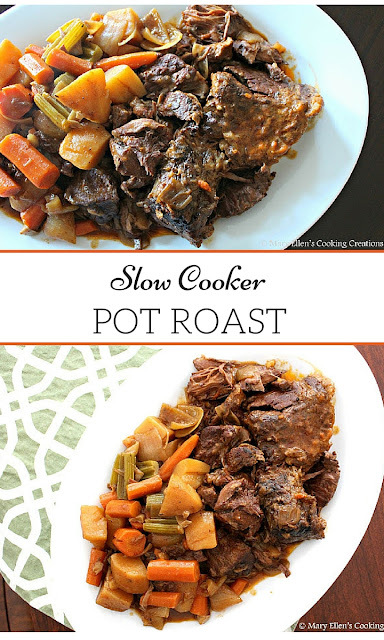 I love new slow cooker recipes! My dad would love something like this! This looks so great! My boyfriend would love it, I'll have to try it out! Wow this looks delicious!! Saving to make for dinner sometime this week!